Abstract. River discharge measurements have proven invaluable to monitor the global water cycle, assess flood risk, and guide water resource management. However, there is a delay, and ongoing decline, in the availability of gauging data and stations are highly unevenly distributed globally. While not a substitute for river discharge measurement, remote sensing is a cost-effective technology to acquire information on river dynamics in situations where ground-based measurements are unavailable. The general approach has been to relate satellite observation to discharge measured in situ, which prevents its use for ungauged rivers. Alternatively, hydrological models are now available that can be used to estimate river discharge globally. While subject to greater errors and biases than measurements, model estimates of river discharge do expand the options for applying satellite-based discharge monitoring in ungauged rivers. Our aim was to test whether satellite gauging reaches (SGRs), similar to virtual stations in satellite altimetry, can be constructed based on Moderate Resolution Imaging Spectroradiometer (MODIS) optical or Global Flood Detection System (GFDS) passive microwave-derived surface water extent fraction and simulated discharge from the World-Wide Water (W3) model version 2. 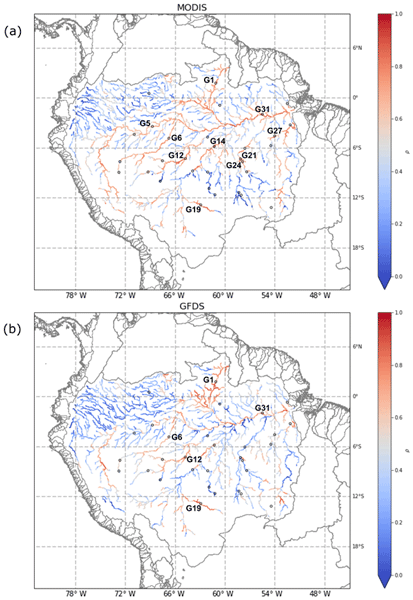 We designed and tested two methods to develop SGRs across the Amazon Basin and found that the optimal grid cell selection method performed best for relating MODIS and GFDS water extent to simulated discharge. The number of potential river reaches to develop SGRs increases from upstream to downstream reaches as rivers widen. MODIS SGRs are feasible for more river reaches than GFDS SGRs due to its higher spatial resolution. However, where they could be constructed, GFDS SGRs predicted discharge more accurately as observations were less affected by cloud and vegetation. We conclude that SGRs are suitable for automated large-scale application and offer a possibility to predict river discharge variations from satellite observations alone, for both gauged and ungauged rivers. 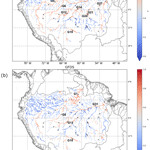 How to cite: Hou, J., van Dijk, A. I. J. M., Renzullo, L. J., and Vertessy, R. A.: Using modelled discharge to develop satellite-based river gauging: a case study for the Amazon Basin, Hydrol. Earth Syst. Sci., 22, 6435-6448, https://doi.org/10.5194/hess-22-6435-2018, 2018. Satellite-based river gauging can be constructed based on remote-sensing-derived surface water extent and modelled discharge, and used to estimate river discharges with satellite observations only. This provides opportunities for monitoring river discharge in the absence of a real-time hydrological model or gauging stations.